…Boris Badenov...and his accomplice, the exotic, engaging, and much taller, Natasha Fatale, were struggling to launch an entrepreneurial mail-order enterprise. Boris held up an issue of the publication, which was a post card-sized piece of paper, printed on only one side. Boris rubbed his chin as he struggled to grasp Natasha’s point. In Dr. John, How to Work for an Idiot: Survive and Thrive without Killing Your Boss, Hoover’s newest send up on corporate America, it’s hard to tell who stumbles and bumbles more clumsily through the business day: neophyte capitalists from the former eastern block or western corporate veterans who should know better than to do half of the things they do. Who better to epitomize the archetypal senior executive than that imposing Frostbite Falls figure with antlers spread wide and a profile that protrudes into next week? Step aside Warren Benis, Ken Blanchard, Jim Collins, Steven Covey, Spencer Johnson, Donald Trump, and even you, Jack and Suzy Welch. A fresh new voice speaks for organizational excellence and competitive supremacy in the global marketplace. Nowhere is this more evident than when the startup Frostbite Falls Mitten Company engages its employees in a cacophony of training exercises designed to build teamwork. As you might expect, the maladroit moose misinterprets the intent of the exercises and discovers what he believes to be true leadership potential in a group of overzealous, safety-goggled, paintball gun-wielding managers who open fire on a group of peers who are exposed and vulnerable as they attempt to maneuver a ropes course high above the frozen tundra of Moosylvania. As he’s done in his previous books, the author, a senior consultant for Partners in Human Resources International in New York City, finds humor at his own expense and takes shots at his own ilk as Boris and Natasha, having failed in their own start up, turn to the next logical career choice—consulting. No sooner had the door to WayBac machine closed than Sherman and Mr. Peabody were standing near the main road running south from Brussels, Belgium. The year was 1815. Soldiers were being ordered about all around them and shells burst in the air above their heads. Just then an artillery round bursts among Napoleon’s ranks. With that, the French Emperor galloped off toward his date with destiny. 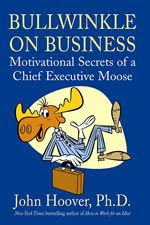 Besides the dramatizations, Bullwinkle on Business also contains ten practical “how-to” business exercises (one for every chapter) in everything from drafting a corporate vision to aligning organizational design with the natural strengths and talents of the employees. Hoover has crafted an entertainment and learning hybrid that’s bound to help any organization get more bang for their bucks, with lots of opportunities for your army to march on its belly laughs.